I want you to tell you a funny and cute story that happened to me and my family 15 years ago. One Christmas day, December 30th, 1994 to be exact, my brother and I were outside of our house washing my mother's car. Suddenly we saw a small dog in the neighborhood. He saw us too, and started to wag his tail. 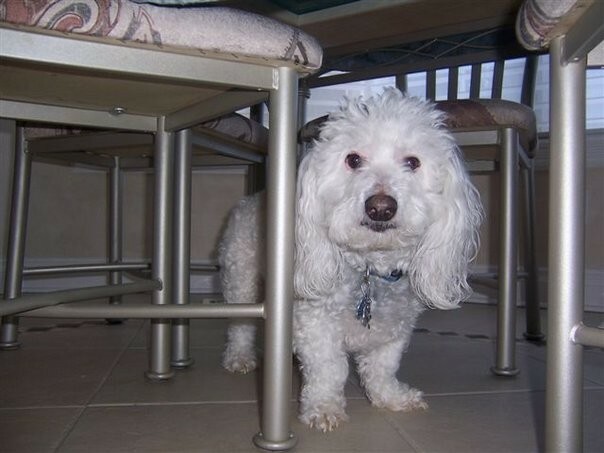 He was a small, white dog with curly hair. We thought that he was lost because his hair was dirty. Then my brother told me we could give him some food, and that's what we did, we gave him the spaghetti that we had been eating for lunch. When the little dog smelled it, he ate it quickly. "Poor dog!" I said. I ran into my house to tell my mother what was happening, and she was very angry because she didn't want any pets in the house because of the hair they left, and the food, and the trouble it would take to give them what they want and the medicines when they are sick. In other words, my mother said that we didn't have enough time or resources to take care of him. My brother and I started to plead with her: "Please, please, please, we promise you that both of us will take care of him." We spent a lot of time telling my mom that we wanted that dog. She said, "Ask the neighbors who the dog's owner is. If he doesn't have one, you can take him." My brother and I ran to ask everybody and nobody knew the little puppy. We were very happy about that and we adopted him. We took him to the doctor, I prepared a bath, I bought medicines, his bed, his coat, and everything he could need. The doctor calculated his age at 1 year. He was a baby!!! And he was very healthy, according to the doctor!!! The watchman of my neighborhood told us that somebody had left him near my house. That person wanted to get rid of the dog and just did it. Good for us!!! Over the years, we've seen that he is a good dog. If he wants to pee, he knocks on the door. His behavior is very nice. His name is Niño;, and my mother loves him. Now he is 16 years old, well, everybody in my house loves him. I do especially because he is my baby. I sleep with him, I take care of him. Now, because he has aged, he has started to feel bad. His stomach is not very good. He's started to go blind, and he has already lost all his teeth so that he can only eat soft food and water. When I was planning to come here, I was thinking of Niño because I didn't know how much time he was going to live. I will return to my country in a few months, and I hope that he will be okay. I will buy some presents for him. 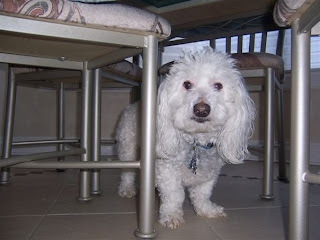 Everyday I write to my mother and ask about everyone in my family, including Niño, because he is one of my family. She said that he is very good. Sometimes he spends the time only sleeping, and wakes up to eat and then goes back to sleep. Sometimes he feels sick. I am very lucky because my mother is taking care of him like I do. For these and many reasons I love the movie MARLEY AND ME, it is about a dog's life, and everything that happens in that movie I have lived through myself with my Niño. When Niño dies, I don't want any other dog, because he is the only one for me. That Christmas was one of the most special in my life. I LOVE and miss you, Niño, PLEASE NEVER DIE !! !